When you walk down the aisle and say “I do” to the person you love more than anything in the world, the thought furthest from your mind is divorce, and yet it ends roughly half of all marriages in the United States. It happened to Christina Pesoli, a breakup coach and relationship expert. 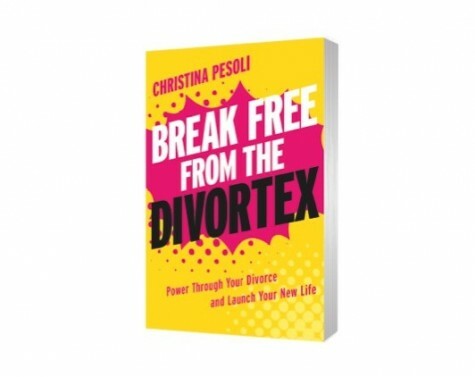 In her new book Break Free from the Divortex: Power Through Your Divorce and Launch Your New Life, she helps those going through the pain of a divorce find their way out of the spiraling hurt and confusion. CupidsPulse.com had the pleasure of interviewing Pesoli about her experiences and her book, which was released yesterday, August 26th. We love the term “divortex” and the way you define it! What initially made you want to help people entering this stage of divorce? Perhaps not surprisingly, it was my own divorce that made me want to help other women escape from the divortex and move forward with their lives. The thing is, when I was going through my divorce, I knew I wasn’t my normal, levelheaded self — as did everyone else around me (the signs weren’t subtle). Still, I had no idea how to get back to something that resembled the regular me again. After stumbling around for a few months, things started to get better, and I slowly began to piece together a new life. Eventually, I started hearing from other women who were in the earlier stage of divorce. Having just lived through it myself, I realized that I might be able to help them avoid the trial and error that I had to resort to myself. I reflected on my own experience and drew up a road map of the most direct route possible, minus the wrong turns and dead ends along the way. Related Link: Considering Divorce? Ask Yourself Three Questions. When it comes to your own divorce, what would you say is the most valuable lesson you learned? The most valuable lesson I learned was that I was not powerless, no matter how terrible things were at any given moment. No one has power over everything, of course, so that’s important to remember too. But when you feel like the rug has been pulled out from under your life and you’re laid out on the pavement wondering what just happened to you, it’s easy find yourself feeling like a helpless victim. It takes a lot of hard work to reconstruct your life. If you feel powerless, you’ll never even get started, let alone finish the job. And getting started is critical, because the very act of rolling up your sleeves and getting to work actually generates more power. The more you work to reconstruct your life, the more power you get. So, there’s kind of a Jedi mind trick about the whole thing: You have to remind yourself that you have power at the very moment when you feel like you don’t have an ounce of it. This mindset is essential to getting back on your feet. Your divorce also involved your children, which can make things much more difficult. What is the best way for someone to explain their divorce to their children? Okay, so this is a counter-intuitive answer, but hear me out: I believe the best thing you can do to help explain divorce to your kids actually happens well before you get a divorce. That’s because the best thing you can do is to not promise them that you will never get a divorce. Think of it like this: You can’t promise your kids you’ll never get in a car accident. Of course, you don’t want to get into a car accident. You really and truly hope you won’t, and you’re going to do your best to drive safely. But despite all of that, you might still get in a wreck someday. Also, when you learn that a couple is getting a divorce, don’t react to the news as if it’s a tragedy from which those involved will never recover. You can acknowledge to your kids that divorce is hard and sad while still conveying that you have confidence that those involved will ultimately work through it and be okay. In other words, treat the news more like a broken leg than a terminal illness, if you get my drift. When it comes to telling your kids about your own divorce, they need to know what divorce does and does not mean for your family. Divorce does mean that their mom and dad will live separately and no longer be husband and wife. Divorce does not mean that the kids will lose family members. After the divorce, they will still have a mom who loves them and a dad who loves them. The schedule and the living arrangements will get restructured, but who their parents are and how much their parents love them will always stay the same. Before the divorce itself, there comes the decision about whether or not to get a divorce. When do you think is the right time for a couple to start the divorce process? The question of when to pull the plug on a marriage is a personal one. I once had someone who was contemplating divorce ask me if she would still be able to afford organic produce if she went through with it. I told her probably, but if that was her biggest concern, she wasn’t ready to get a divorce. It’s hard to have perspective when you’re smack dab in the middle of it. That’s why I tell people who are thinking about getting a divorce to ask themselves two questions. The first is why they want to get a divorce. That one is usually easy to answer — things like, “He cheated,” “I’m not in love anymore,” or “I’m bored.” The second and more important question is how being divorced will remedy the problem. That question is much harder to answer — and often overlooked. Once you have worked through both questions, you will either arrive at a clear answer or you’ll still be uncertain. If you are uncertain, that, in itself, is your answer for the time being. If, on the other hand, you conclude that divorce is in fact necessary, the clarity that comes from having worked through these questions and arrived at a definite answer will give you the resolve to make it through the ordeal. Lastly, do you have anything else to add? One of my favorite pieces of advice for women going through divorce is this quote from Winston Churchill: “Never, never, never, never give up.” (I think that’s how the quote goes, give or take a “never” or two.) And yes, I realize he was probably talking about war rather than slogging through a divorce, but still, I see parallels. To be clear, by not giving up, I don’t mean digging in, dragging things out, or making your divorce into a bloodbath just for the sake of “winning.” I mean never ceasing to lose focus on where you are now and where you’d like to go in the future, then letting those things inform the choices you make along the way. Do that, and you’ll get to a good place soon, I promise. Pick up a copy of Break Free from the Divortex today! You can also visit Christina’s website EmotionalHardbody.com and follow her on Twitter (@ChristinaPesoli or #Divortex).